Joyce Wycoff Connecting through Art: What's in a Name? 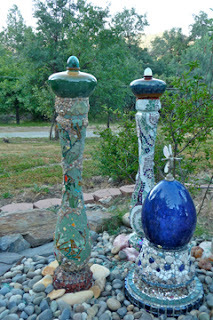 This is "Wind," the second of five columns (center) in the piece of mosaic yard sculpture I've been working on for a few months. It is an emerging piece that changes in scope and detail frequently. The concrete columns were found at an estate sale, the left-overs from a huge balcony. I bought ten of them, having no idea of why. The person who died was a fireman so there were also a lot of fire house items including one heavy, metal "thingy." I don't know what it was originally used for but it called to me and and became the center because it held a large, cobalt blue egg ... found at the same sale. The egg on top of the holder launched the very vague idea of a starting place. Yesterday at the Positive Living Center, one speaker talked about "starting without knowing." This piece definitely follows that suggestion. Most of the mosaic people I talk to seem to be able to sketch out their ideas, make patterns and actually design their works. All I had was a rough idea that I wanted a "spirit garden" and the willingness to take one step at a time and then wait for the next step to reveal itself. But, so far, the one step and then the next seems to be working. The next "next" was the number five. In numerology, the number five carries the idea of playfulness and fun, which seems like a good core concept. So five columns were placed in a ring around the core. They became earth, wind, fire, water, and spirit and shadow. Yesterday I finished "Wind" and planted it. But, I also found a small, winged sprite on sale at the garden store. 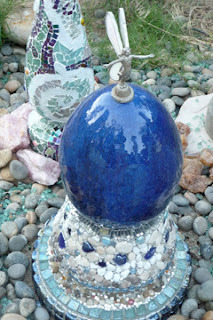 She demanded her place on the central blue egg ... the muse of play? the spirit of laughter? Now that the piece is taking shape, names are playing around in my mind. Bob Hand, our speaker at PLC yesterday, gave us a different take on Genesis as he told us that our place is not to "create" ... that's God's job ... our job is to name God's creations. At first I resisted the message ... of course we create. I've spent most of my lifetime teaching that creativity is part of each of us. But, perhaps it's definitional. God (feel free to substitute any of the many names of God here) created everything first ... before that "big C" act of Creation, nothing existed. Maybe what we do is "little-c" creativity, which is actually just rearranging already existing things in, perhaps, a new way. I also resisted the thought that we were just namers. How much could it matter what name we give to something? Call a child Devon or Don ... does it change the child? But Bob's message was deeper ... what we call something changes us. And, we have the opportunity to name everything around us every moment. We can wake up and name the day busy, scary, bad, hectic, a disaster ... or we can name it promising, joyful, fun, loving, wonderful. We can look at a piece of key lime pie and name it "fattening" and fear it or we can name it "sweetly tart" and decide whether or not it fits our health objectives. But, I'm still looking ... so if you have an idea, I'd love to hear it. Enjoyable post! Whenever I think of naming, I think of our Native Americans' ability to be both poetic and on point at once. My guess is the name your creation needs you will discover on your own. Thanks, Maureen! You're probably right ... but I've been "finding" so many things that I thought someone might have an idea that would turn on a new path of thinking. This sculptured garden is creating itself into beauty. How wonderful! Keith Jarrett played a piece in the 70s called Sol y Sombre -- one of my very favourite pieces of music ever. I've searched for it for years to no avail. How lovely to read the name here today! This is amazing, Joyce; just fabulous! Take your time naming it; I'm certain something awesome will come along that will be exactly right! Thanks everyone for the lovely comments. Since it's going to take a few more months before this is done, there is plenty of time for the name to come ... I'll let you know when it does. In the meantime, I'll just keep glueing!